Google just launched a brand-new version of its ultra-cheap media streamer. Our guide will get you up to speed. It’s been two years since Google launched the original Chromecast streaming media player, and it remains a novel concept. Unlike every other media streamer, which ships with a remote control for moving through menus, Chromecast uses your phone or tablet as the remote. It’s a far-out concept that you’ll either love or hate. 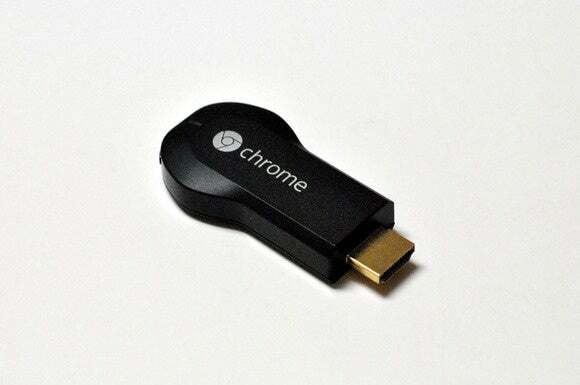 What is Chromecast and how does it work? Chromecast is a $35 streaming media player that plugs into your TV via HDMI, letting you stream video from services such as Netflix and Hulu. But instead of including a traditional remote control, Chromecast uses the apps that are already on your phone or tablet to send video to the television. 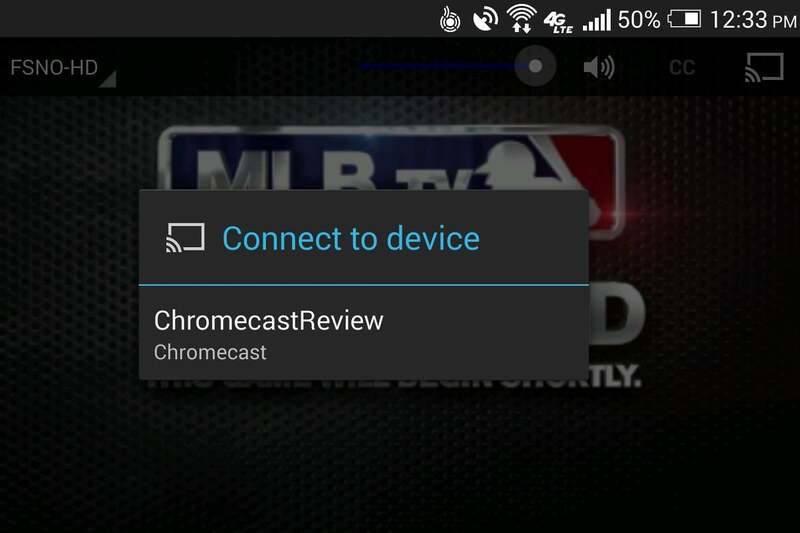 Supported apps display a Cast button, which you can press to connect with Chromecast. Select a video and playback begins on your television a few seconds later. This works with both iOS and Android apps. Casting a baseball game from MLB At Bat’s Android app. If you have a laptop or desktop running Google’s Chrome browser, you can also cast from the websites of some streaming services, provided you first install the Google Cast extension. Just look for the Cast button among the website’s playback controls. Which streaming services are supported? Chromecast also supports a fair number of streaming-music services, such as Pandora, Spotify, and iHeartRadio. And beyond just streaming media, Chromecast has apps for viewing photos, sharing presentations, and playing games. The full list of supported apps is here. Do I need a separate remote control for volume and other things? You might. Most apps have built-in volume controls for Chromecast, but these are separate from your television’s master controls and will not exceed the highest volume you’ve set on the TV itself. If your TV supports HDMI-CEC, you’re in slightly better shape as Chromecast can automatically turn on the television and switch to the appropriate input when you start Casting a video. (You may have to find and enable HDMI-CEC in your TV’s settings first.) Even then, you’ll still want a remote to turn the TV off after a Casting session. 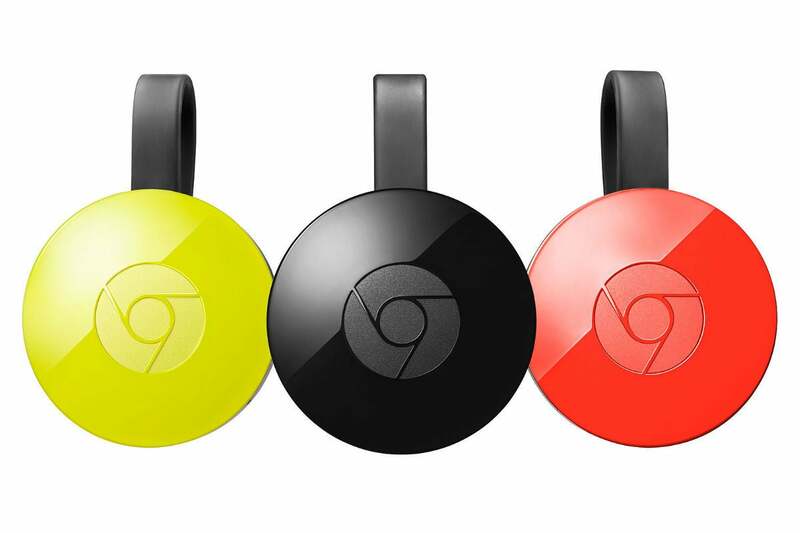 New Chromecast hardware, in three colors for some reason. 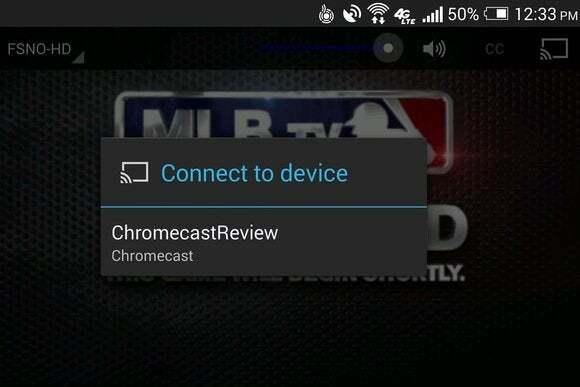 Can you use Chromecast with a physical remote control? Some TV remotes do support basic play/pause controls for Chromecast through HDMI-CEC in certain apps, but this is more of a fallback measure than anything else. Because Chromecast doesn’t have a TV-based menu system, a proper remote wouldn’t do much good. Having said that, Google’s Android TV platform offers all the same features of Chromecast, alongside a proper TV interface and apps that you can control with a remote. If you like the idea of Chromecast but don’t want to lose the remote completely, Android TV devices such as Nvidia Shield, Nexus Player, and Razer Forge might be your answer. Does it have universal search, like other streaming players? As of this week, Google’s Chromecast app for Android lets you search across streaming services and get recommendations from the apps you already have. (A similar update is coming to iOS.) You’ll find a deep dive into the apps strengths and quirks here. 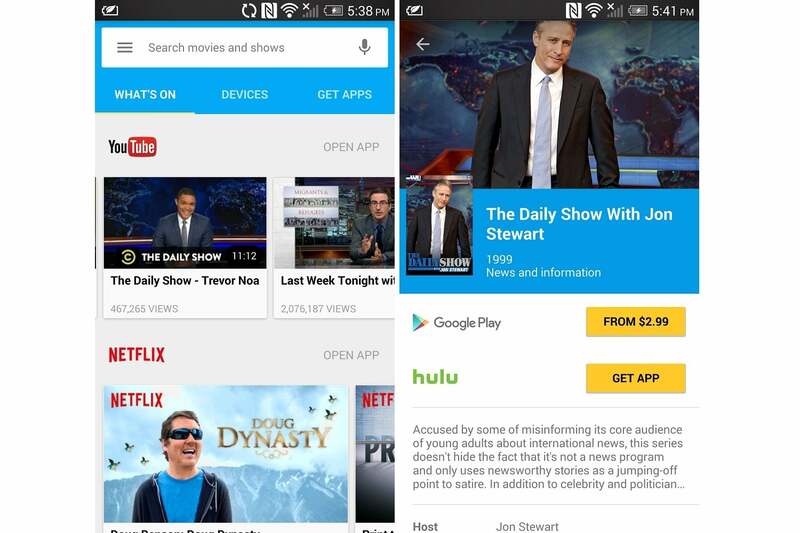 The Chromecast companion app offers a starting point for search and recommendations. How is this different from Apple TV’s AirPlay? In most cases, AirPlay works by beaming the video or audio directly from an iOS device to the television over Wi-Fi. Your iPhone or iPad must remain connected to the network, and it can’t play any other video or music while AirPlay is in use. By comparison, Chromecast merely sends a set of instructions to the television, which then starts streaming straight from the Internet, so you’re free to use your phone or tablet however you want. Casting has virtually no impact on battery life either, since it’s not responsible for beaming the actual content. If there’s an advantage to AirPlay, it’s that it works with most apps without developers needing to do anything to support it. But even this is becoming less of a differentiator as more apps support Chromecast. Does anything similar exist on other media streamers, such as Roku or Amazon Fire TV? Both Fire TV and Roku support casting videos from YouTube and Netflix, using an open protocol known as DIAL. You’ll find this capability in some smart TVs as well. Chromecast’s main advantage is that it supports considerably more apps. Down the road, Amazon may have an answer to Chromecast with Fling, which promises to let app makers easily port their Cast-enabled functions to Fire TV. But so far, very few app makers have gotten on board. Can I mirror my device’s display on the big screen? Screen mirroring is supported on phones and tablets running Android 4.4.2 or higher, and is optimized to work best on a subset of these devices. There’s no way to mirror from iOS devices. Laptops and desktop PCs can mirror any open browser tab in Chrome with the Google Cast extension installed. While mirroring can be useful for watching content that doesn’t support Chromecast natively, it does have some downsides: The quality of the stream can be unreliable, and it’s a major drain on battery life. Can I play back locally stored photos, videos, or music? Google doesn’t build this capability into its own software, but third-party apps such as BubbleUPnP and AllCast can serve this purpose. Chromecast also supports media servers such as Plex for streaming from a networked PC or NAS box. What’s this “Google Cast” I keep hearing about? 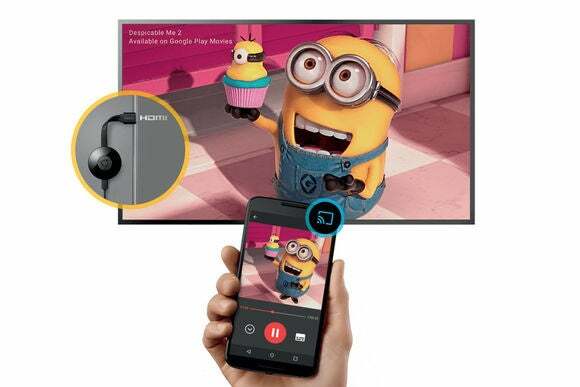 Google Cast is the underlying technology, which appears in other products beyond Chromecast. Android TV devices, for instance, are Google Cast-enabled, giving them all the same capabilities as Chromecast. There are also Google Cast-enabled home speakers, which stream Internet music from the same apps that Chromecast supports. It’s not the most elegant naming scheme, but think of it this way: Chromecast is basically a cheap product for adding Google Cast capabilities to devices that don’t have them built in already. What’s the difference between the old and new Chromecasts? The biggest change is the physical design, which now hangs freely away from the TV’s HDMI port through a bit of extra cable, and the device is available in three colors. The old design was more likely to block access to adjacent HDMI slots, though it did include a cable extension if that was a problem. The previous version of Chromecast could block neighboring HDMI ports. The new Chromecast also supports the latest 802.11ac Wi-Fi standard, has an improved antenna structure, and adds as “Fast Play” feature that pre-loads content it thinks you might watch next. The price is unchanged at $35, though you might be able to find the older version on clearance at some retailers. Any other questions? Ask in the comments or find me on Twitter.